Think3dPrint3d: Duet, 20x4 LCD screen and SD card. 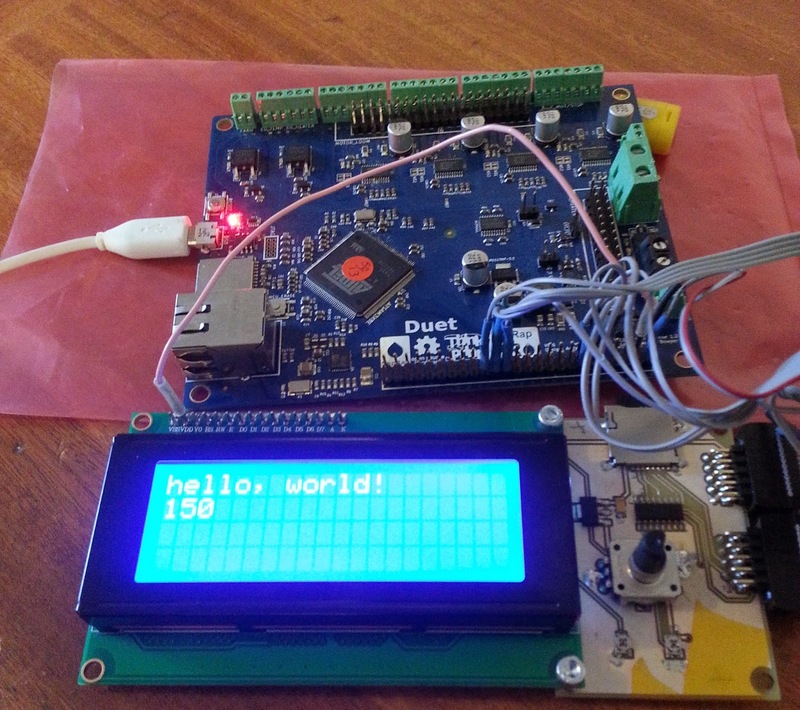 Duet, 20x4 LCD screen and SD card. Although the Duet communicates over Wifi and I can connect to it with a web browser on my phone, I still get many requests for a LCD based controller. I agree that being able to use a simple controller for quick, common functions is a good idea, things like homing the printer, preheating, starting a print etc. Think3dPrint3d have been providing controllers for older electronics that do this since we started, first with the Panelolu then with the Panelolu2 so it's time to port this to the Duet. I decided to keep it simple to start with, so rather than get the Panelolu2 working, which would require I2C and headaches with 3.3V and 5V logic, I started with the PanelOne, a very basic LCD, Encoder, SD card combination which we are using on our Kossel Mini Kits. I tested this with two other LCDs (old generic ones off eBay) and it worked with them as well. However as it's outside the guidelines of the LCD manufacturer's datasheets there is no guarantee that all types of HD44780 character LCDS will work in the same way. 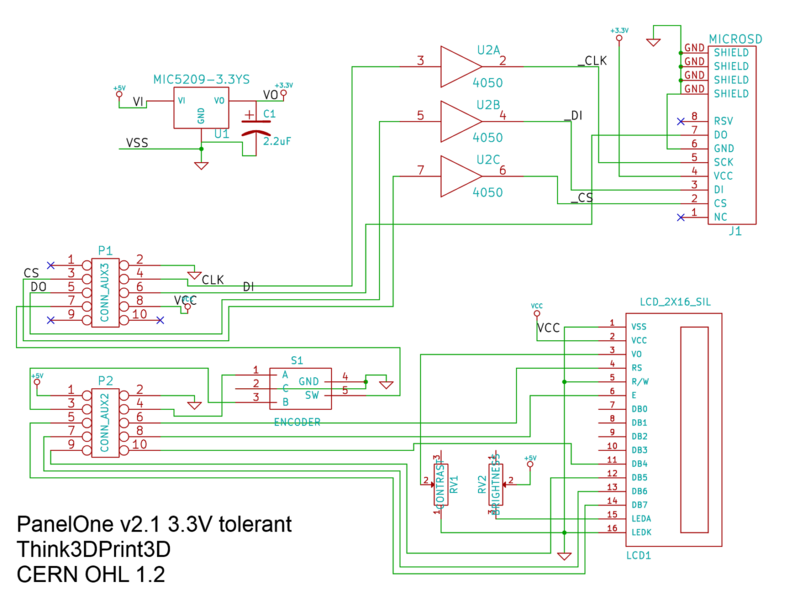 This sketch, and the adapted Kicad schematic are all on the Think3dPrint3d github. I will test more LCD screens and hopefully will be able to get the next batch of PanelOnes compatible with both 3.3V and 5V. The big job will be to port and adapt the Marlin menu system to RepRap Firmware. If anyone wants to assist with this project then drop me a line and I may be able to help with some hardware (duet board + LCD screen). Having looked at the two firmwares it looks as if the best approach would be to start from scratch and generate a menu system that creates gCodes like the web server in the RepRap firmware, rather than calling functions directly as in Marlin. I have just spent the afternoon trawling through the Marlin LCD implementation and I tend to agree - It would have more flexibility if the menu system used Gcodes. The majority of the functionality on the existing Marlin menu system is implemented in gcodes by RepRapFirmware. An additional example would be the ability to tie certain choices of the menu system into macro g-code files stored on the SD card. That would mean that the menu system could be easily modified to work with anyone's hardware by modifying the macro. Yes loading gcode macros would be an ideal way to cope with allowing for customisation to commands like preheating. If you are up for helping out then send me an email and we can discuss further! Planning to buy Duet boards. But, confused with the LCD controller. Now-a-days the 3d printers are not selling without LCD controllers. Here you have shown the connection. But, it is looking like, the pins from the flat core cable of LCD controller are split and connected to the DUET, which looks very complex. As you told, have you tested with some other LCD controllers? Also have you tested with adding a file and fully printed with this controller. Looks like this post is 1 year old, still there is no clear update. Can PanelDue be used? But, that is a costly option in which the price equals the board cost. This is a hardware proof of concept, which I am not currently taking further and most people are happy with using Wifi on their phone or tablet, and those who want more use the PanelDue. This issue is the firmware work required to make this a reality.